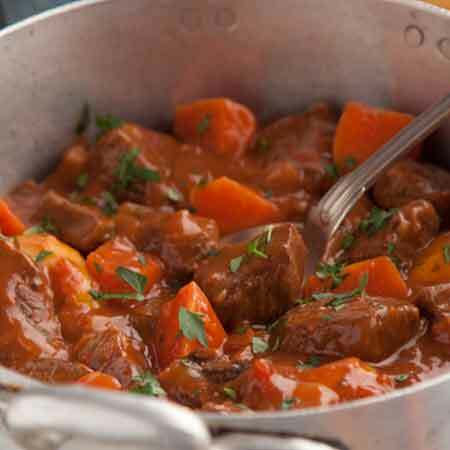 This is a delicious beef stew recipe that tastes even better on the second day. 1. Preheat oven to 150C. Season beef with salt & pepper and dust with flour. Place a large hob proof casserole dish over a medium heat and add a dash of oil. When hot, brown the beef (in batches if necessary) until colored on both sides. 2. Add diced carrots, onions, garlic & herbs, stirring over a medium heat for 2-3 minutes. 3. Pour in the red wine to deglaze the pan, boil for 2-3 minutes, then stir in the tomato puree. 4. Add the stock and bring to simmering point. Mix well, then cover with a lid but allow some steam to escape. 5. Place in the oven for 2.5 hours or until beef is tender.